bl.uk > Online Gallery Home	> Online exhibitions	> Asia, Pacific and Africa Collections	> Bailie Guard [Lucknow]. 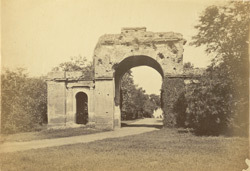 This photograph of the Baillie Guard gateway from 'The Lucknow Album: containing a series of fifty photographic views of Lucknow,' was taken by Darogha Abbas Ali c.1874. The Baillie Guard gateway is the entrypoint to the Residency Complex, named after Major John Baillie, who was the Resident in 1811-1815. The Residency Building, built c.1800 for the British Resident in Lucknow, was a key site of the Siege of Lucknow during the Uprising of 1857. Approximately 3000 British inhabitants took refuge within the complex.